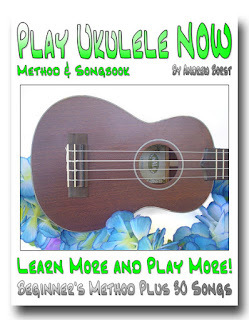 Here are a few recommendations, where to find Play ukulele NOW books, some of my other books, other items and affiliates. Whats different about the FUN WITH FOLK GUITAR methods? 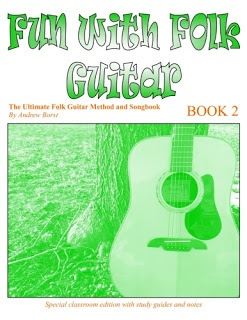 A truly graduated method for traditional folk guitar accompaniment, no students will hit a "brick wall" and can not proceed on to the next lesson. It really works for group lessons or the classroom. Students will gain an understanding of rhythms and be able to choose an accompaniment for any song and be able to create their own versions of various rhythms. 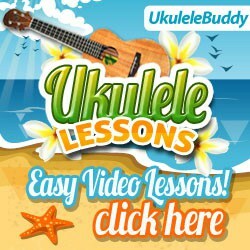 If you are looking for good video lessons - Ukulele Buddy provides ear training, basic theory and various strumming techniques explained in a way beginners are sure to easily understand. This lesson course has the most important ingredient you should look for in lessons overall - a good teacher. A good teacher always makes learning easier. When they say it's just 7 minute videos it's not that you don't practice, it's that playing along with the videos and playing the songs IS the practice and when you are asked to practice, it will be playing along with the instructor, not practicing alone. This is the same way I structure my group lessons playing the songs and having fun IS the practice. That's the best way to insure everyone sticks with it and has fun. ​If you're willing to kick back and strum along with my quick and simple videos, you'll be "hand-delivered" to a level your friends go "Wow! in a matter weeks. Mike Upton launched Kala in 2005. Prior to starting Kala he worked at Hohner and was responsible for the development of the Lanikai ukulele line. After starting Kala, Mike quickly established the new ukulele manufacturer as the leader in the market by providing the best and most consistent instruments in the price range. The best way to tune your ukulele is with a digital tuner. It will tell you which note you are closest and how close you are to it. There's a meter on it that will tell you when you're in tune. The Snark ukulele tuner is one of my favorites because it clips right on to the ukulele and can be used with some background nose. Get FREE 2 day shipping on your new ukes by trying Amazon Prime! Amazon is a great place to get all of your ukulele gear, why not try Amazon prime for FREE! It's worth it for the free 2 day shipping alone.